For non-New Yorkers, here’s a quick lesson about my city. New York City is made up of five boroughs: The Bronx, Brooklyn, Queens, Manhattan and Staten Island. In my quest to eat more often outside of Manhattan, Staten Island is the least represented on this site. Although it has the most suburban feel in all of the five, it has been experiencing a large growth of Mexican immigrants in the last 12 years. The Mexican community–documented and undocumented–have contributed to the diversity of Staten Island, especially on the north shore. Staten Island has historically been known as the “whitest” borough in New York City, but now, almost 2% of its entire population is composed of Mexicans. According to the 2000 Census, Mexicans were the second largest foreign-born group in Staten Island. 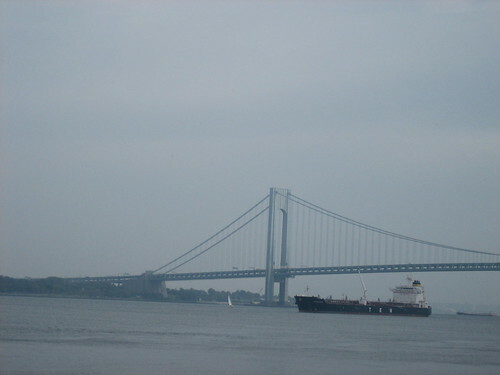 Besides more affordable housing, the mighty Verrazano-Narrows Bridge helps connect the borough to Brooklyn, Long Island and New Jersey, so a lot of contractors seek out workers there to fill jobs. I visited to seek out the best taco. I started this food project last year and it’s gotten hot enough outside to warrant a continuation of my search, so I enlisted Staten Island locals Sean and Jane, and of course, Cameron’s stomach, to help me find the best tacos in the neighborhood. 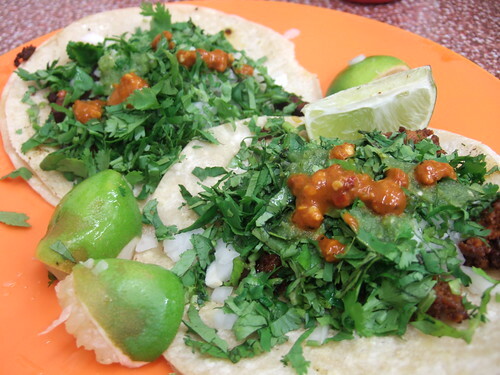 I had a few stores in mind from a few Google searches, but we let them walk us to the neighborhoods where the Mexicans live and hang out to find the more authentic tacos. When available, we always bought the chorizo because it was the easiest to compare. I’ve had so many chorizo tacos in the last year and a half that I think I know a good one when I taste one. When the offal kinds were on the menu, though, I gravitated towards them since I didn’t have a lot of them the last three times I went around Manhattan. My favorites were the longaniza and chorizo from La Conchita, the suadero from Tacos La Abuelita and the cabeza from Tulci-Mex. We were famished when we arrived in Staten Island via the free ferry ride from downtown Manhattan. We walked past the Taco Bell and made our first stop in St. George. (Who is by the way, not a real saint, but someone who was treated like one because he bought all the land the community at the time needed.) Even though we knew we had to make room for a lot of tacos, we still ordered one apiece from El Gallo. With the semi-chewy bistek, the spicy and salty al pastor and two of the lengua, or tongue, we were off to a very good start. The cecina taco was the best. Cecina is a traditional cut of beef in Mexico, sliced thin, salted, and then laid out to dry under the sun. It’s like their version of jerky, really. We also had the lengua, the overdone bistek and of course, the chorizo. 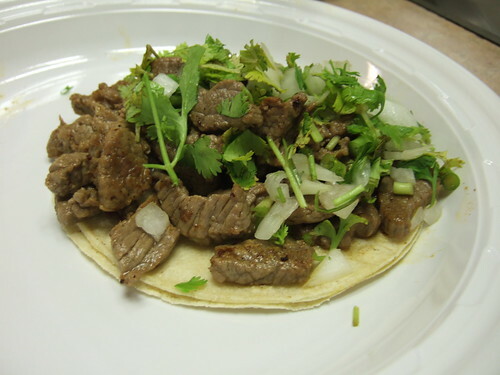 Everything was deliciously salty which is why I love simply-prepared tacos–they bring out the Filipino in me. 3. La Mixteca Poblana, 104 Victory Blvd. They only had the al pastor kind here which is skewered in a vertical rotisserie. Like any gyro store, it slowly spins while cooking. The meat is seasoned with adobo and sometimes pineapple or avocado. What I liked was their brown tomato sauce. It added a toastier taste to the tacos. They had the most offal selection here, but no one spoke English so it was hard to get a translation. I ended up ordering the only ones familiar to me. 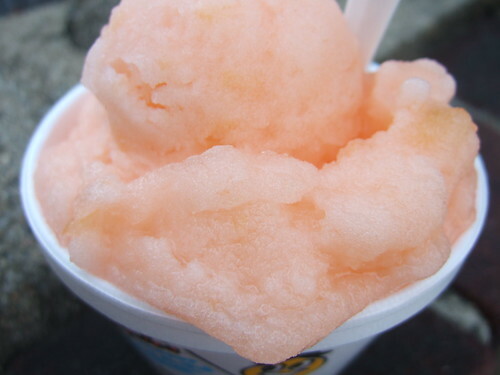 The cabeza was a favorite, or the head, because the gelatinuous stuff melted in our mouths. We had the orejas, or the ears, which had some crunch to them. Oh, those little earlobe bones! 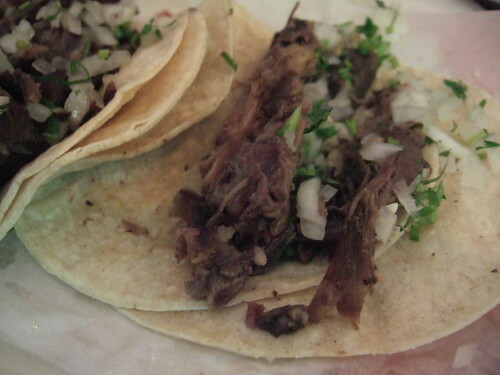 Finally, a barbacoa kind, or goat! Like any goat stew I’ve had, this one was stringy and gamey. Unfortunately, tiny sharp bones were included. They are really difficult to separate when you’re stewing a goat for several hours and everything falls apart. The cecina and the chorizo were included in our order but they took a while. Thank goodness for cold Coronas. In the Philippines, we use longaniza and chorizo interchangably, but both were available here. We didn’t really care which was which because both were the best we’ve had all day even though at first look, all you can see was cilantro. They were crunchy and the tips were a little burnt, which made a lovely snack when Mexico scored a third goal against Paraguay. The tacos here were a dollar each but they had the “especiales” for $2 and $3. We didn’t ask what made them special but the dollar ones tasted good enough. We ordered the buche, or the stomach, the cueritos, or pork skin, and the suadero, which is like stewed beef with all the fat included. The buche was a little unnerving to some of us because it obviously looked like chopped up intestine. The pork skin wasn’t as cripsy as I would have liked, but the suadero reminded me of lechon paksiw without the sour taste. The best part of this trip to Staten Island? Ralph’s ices after all those tacos! I never knew this about Staten Island. Crazy. Thanks for the taco info, Cia! oooh sarap. u got me craving! Those were earlobes we ate!? Tricky tricky. Mmm – earlobes. My vote for fave – Cecina tacos and watermelon ice. Thanks for the lovely (but scorching) Saturday. You still owe me one Corona. You have done us a great service for finding and reviewing these places in our neighborhood! Thanks so much, now we have to try them all. 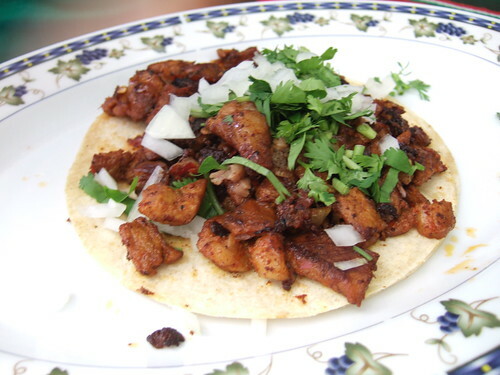 Although it’s a restaurant more than strictly a taqueria, we really love El Mirador, Corson Ave just off Victory Blvd. I had their tacos al pastor last night. 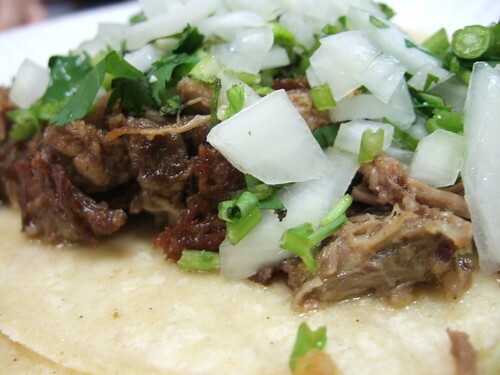 I usually have lengua or barbacoa, which are excellent. Their bistec is a little less exciting, and carnitas are pretty good. Thanks so much! 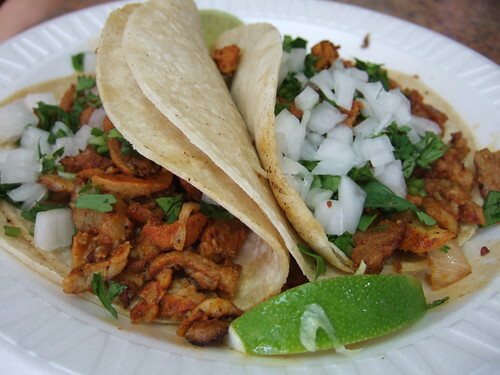 an “off”-al topic but I had a pair of tripe tacos at Taqueria Coatzingo in Jackson Heights, if you’re interested in funky organ meat tacos. the tripe was deep-fried, tasted very funky, but quite good. one of mine had some graininess (I’d prefer not to think what that was). with a lot of lime and hot sauce, makes for a pretty damn funky taco. try it sometime. Queens is my next stop! can i sign up for the queens trip? i lived there for 7 years years yet never really explored the borough. if you ever head uptown (i seem to remember you live in uptown manhattan), try the chicken tacos at wimpy’s (amsterdam btwn 150th & 151st streets). i know it’s just chicken….but i have started craving them! they also have delicious burgers…simple, cheap, but really really good!